In the period 2006-2013, China's power sector adopted a policy which aimed to add large scale units (larger than 600 MW) and decommission small, old (but still technically functioning) and inefficient power plants in order to accelerate energy saving and mitigate emissions. The early-retirement (ER) of nearly 90 GW of capacity and massive new coal power installation in this period significantly altered the pattern of the coal power generation assets. In this paper, it will be shown that the existing structure of coal power installations was built and based on stock, stock efficiency and assumptions on the yearly distribution of early retirement units. With regard to this structure, we measure the effects of large-scale closure on the aggregated age of power generating plants, efficiency and cumulative CO2 emission. It shows that 0.1 billion tons of CO2 reductions can be obtained as a result of this policy for the period 2006-2050, compared to the counter-factual case, i.e. with no ER during 2006-2013. Instead, 1.2 billion more emissions are to occur if coal power additions are completely banned from 2020 as a stringent coal control policy. The substantial difference is fundamentally induced by the slow turnover nature of long-lived power assets and the younger coal plants in the ER case, which would run for a longer time and result in more emissions. 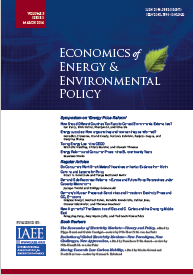 It is necessary to take account of how to avoid the "new lock-in effects" of ER action intended to unlock existing infrastructures in the context of required climate change mitigation. The early phase-out of inefficient equipment is not necessarily a "green investment".